Motorola Mobility has recently launched Motorola XOOM 2 Android tablet in Italy. 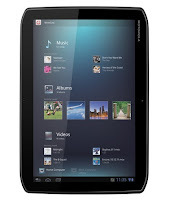 Motorola XOOM 2 is available at TIM stores for 599 Euro (all taxes included). As you may already be aware, the new Motorola XOOM 2 features Android 3.2 Honeycomb, a dual-core 1.2 GHz processor, 10.1-inch HD display with Corning Gorilla Glass for scratch resistance and a splashguard coating. The Motorola Android tablet include the new MotoCast application that lets you stream all your music, photos, videos and documents between your computer to your tablet without any media tools, apps, or cords. Motorola XOOM 2 tablet boasts 1.3 MP front and 5 MP rear-facing HD cameras with digital zoom, auto focus, and LED flash. It has 1GB RAM with 32 GB storage, and 3D virtual surround sound. Motorola XOOM 2 Android tablet is loaded with Business Ready features like VPN support and data encryption. Enterprise features Business Ready with enterprise-grade security and Active Sync for work email, contacts and calendar. USB and Ethernet connectivity, pre-loaded Citrix Receiver and Citrix GoToMeeting. Motorola XOOM 2 also features MOTOPRINT integrated into key apps so you can print wirelessly from your tablet. It is approximately 100 grams lighter than the original Motorola XOOM to make it even easier to take on the road, and can withstand poolside use, spilled drinks or dashes out to the car in the rain thanks to its new splash-guard coating. A battery delivering more than 10 hours of video playback means it can go with you wherever you need to be. Motorola XOOM 2 Android tablet supports accessories. With the Work and Play kit, you can plug your Motorola tablet into the HD Multimedia Station to connect to your HDTV, speakers and other peripherals for large-screen entertainment. Get more done, faster with the included keyboard and mouse with Bluetooth technology. Now, when your tablet is docked, the Smart Controller lets you MC the show from the comfort of your couch. As for the size, Motorola XOOM 2 tablet measures 253.9 x 173.6 x 8.8 mm and weighs 599 grams. Its battery provides enough juice for up to 10+ hours Web usage or over 1 month stand-by. For more information on Motorola XOOM 2 visit motorola.com/mobility. 0 comments on "Motorola XOOM 2 Android tablet available in Italy"